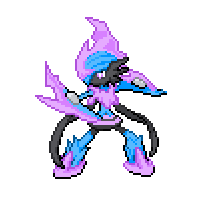 Delta Gallade (referred to as just Gallade in-game) is a dual-type Electric/Ice Delta Pokémon. 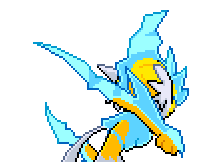 It evolves from a male Delta Kirlia when exposed to a Dawn Stone. 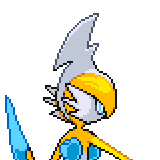 It is one of Delta Ralts's final forms, the other being Delta Gardevoir. 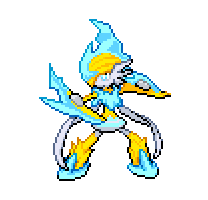 A master swordfighter, it uses both Electric- and Ice-type attacks to defeat opponents. 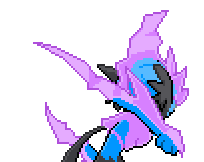 Over time it numbs its opponents and decreases their reaction speeds. 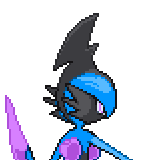 A level of "Start" indicates a move that will be known by a Delta Gallade obtained at level 1. 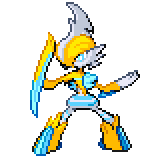 Delta Gallade's Attack and Special Attack are the reverse of Delta Gardevoir's. 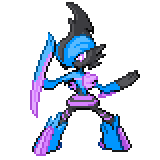 Mega Delta Gallade has the highest base Attack stat of all Electric types as well as all non-legendary Ice types.